About twelve years ago, I moved to York, Pennsylvania, for a new job. Since I’ve been here, I’ve become quite familiar with the area and was thrilled the one day I drove by an old, mostly unused warehouse operation. You see, unlike most such operations that have a bland look, this empty building still had its old signage up from its previous incarnation. The sign, quite proudly boasts that it is (was) the home of the “Record Club of America.” Being a comic book nut, I was familiar with this type of operation since there were often ads for such clubs in the comics and magazines I read. I mostly remember BMG and Columbia House, the two mail-order music clubs active when I was a kid. They had you sign up to get 12 one-penny cassettes or CDs (plus Shipping & Handling) as long as you promised to buy 4 more at regular price (plus shipping & handling). 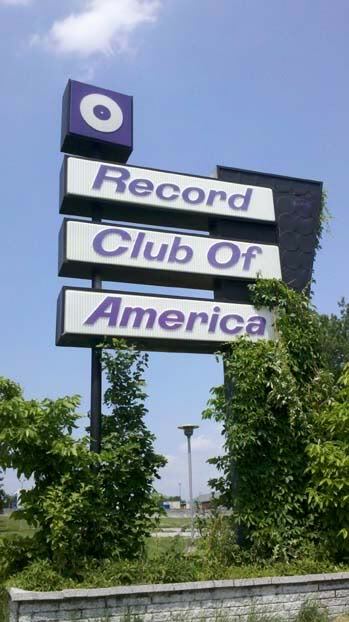 From the moment I saw the “Record Club of America” sign, I knew it was the same type of operation. 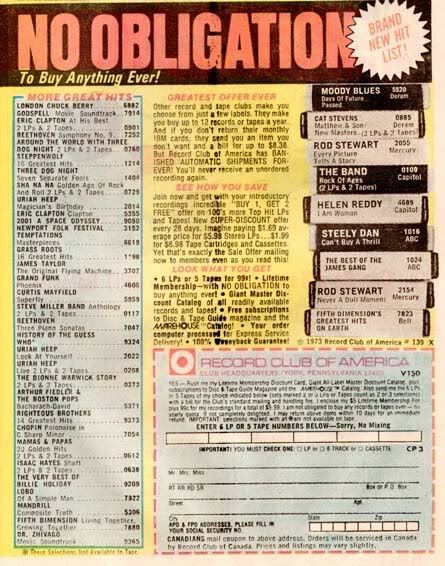 In a two-page spread, it offered some great 8-tracks or record albums for 99-cents (plus Shipping & Handling) with no obligation to buy anything else. I guess the company was just hoping you would keep ordering through their catalog rather than buying from a local store. According to the ad, the Record Club of America is in York, Pa. That’s partially true. Back then, it probably was York, Pa., but as of this writing, it’s now on land on North George Street Extended in Manchester Township in York County. The building is huge. It has several truck bays and a decent front office set up. Since the property is for sale or rent through Rock Real Estate, you can walk right up to the front door and look inside. The official property listing is here, and that includes a 4-image exterior photo gallery. The lobby area is decorated (rather sparsely now) with a “tape” and record theme, and a large interior sign also trumpets the company name. In another set of windows, you can look in and actually see some of their old merchandise — records, 8-track tapes and assorted boxes. These are the real deal too. On the 8-Tracks, you can barely make out lettering. And the rows upon rows of records are all individual albums that have just remained on the shelves since the company shut down. Inside other windows, you see the remnants of old office furniture and a meeting room. The building isn’t entirely unoccupied. The actual warehouse area is in-use by another company, so there’s constant activity at the site. weeks, but there were no monthly selections or cards to send back. you’d find in record stores. That is the best description of the company’s rise and fall as I have ever found. There’s not even a wikipedia entry on it. On a very patient Yahoo! search a few years ago, I did find out that the Record Club of America may very well still exist as a corporate entity. The company name was listed in a campaign donation report for the 2000 presidential election. If I recall correctly, the club gave George W. Bush $500 that year. While I have never called, I have often wanted to contact its realtor and ask for a tour. Not to rent or buy the facility, but to just walk around and take pictures of this interesting slice of Americana. If I do, I’ll be sure to update this blog post. I won’t even charge you Shipping & Handling. I remember seeing some of their ads back in the 70s too. Fun article! …I wish , ‘tho – Perhaps there were issues in having cameras a round ? – that you’d photographed more , ‘specially that lobby you described and the shelves of vintage stuff !!! I somehow missed these guys; I remember belonging to the Columbia record club for awhile during the early 70s. I’d have been all over everything in the Schwann catalog. It’s amazing that so much of the physical plant has survived. I actually do have pictures of the lobby and merchandise, they just came out quite horribly since the window was reflecting badly. I’ll have to see if I can use PhotoShop to brighten them up and post them. I think the building has survived so well because they have so much stock remaining inside. Apparently the owner has money to burn, since he/she has kept the stock for so long.